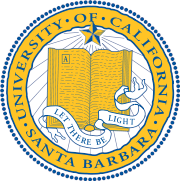 The University of California, Santa Barbara (UCSB) is a selective, research-oriented public university located on the Pacific Ocean in Santa Barbara County, California, USA. It is one of 10 campuses of the University of California. Its current student body is around 20,000. UCSB ranks as the 35th university worldwide and the 27th in the United States in the 2007 Academic Ranking of World Universities, which measures scientific research leading toward a Nobel Prize. U.S. News & World Report ranks the university as the 44th best in the United States in terms of quality of undergraduate education. The predecessor to UCSB, Santa Barbara State College, focused on teacher training, industrial arts, home economics, and foreign languages. Intense lobbying by an interest group in the City of Santa Barbara led by Thomas Storke and Pearl Chase persuaded the State Legislature, Governor Earl Warren, and the Regents of the University of California to move the State College over to the more research-oriented University of California system in 1944. The State College system sued to stop the takeover, but the Governor did not support the suit. A state initiative was passed, however, to stop subsequent conversions of State Colleges to University of California campuses. Originally, the Regents envisioned a small, several thousand-student liberal arts college, a so-called `Williams College of the West,' at Santa Barbara. 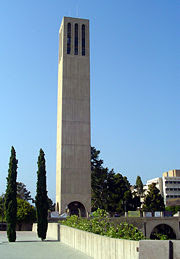 Chronologically, UCSB is only the third general-education campus of the University of California, after Berkeley and UCLA (the only other state campus to have been acquired by the UC system.) The original campus the Regents acquired in Santa Barbara was located on only one hundred acres of largely unusable land on a seaside mesa, however. The availability of a 400 acre ex-Marine Base on another seaside mesa in Goleta, which the Regents could acquire for free from the federal government, led to that site becoming the Santa Barbara campus in 1949. Originally, only 3000-3500 students were anticipated, but the post WWII baby boom led to the designation of general campus in 1958, along with a name change from "Santa Barbara College" to "University of California, Santa Barbara," and the discontinuation of the industrial arts program for which the State college was famous. A Chancellor, Samuel B. Gould, was appointed in 1959. All of this change was done in accordance with the California Master Plan for Higher Education. UC Santa Barbara is one of only 62 research-intensive institutions elected to membership in the Association of American Universities. UCSB celebrates the five Nobel Prizes won by faculty members since 1998 for landmark research in chemistry, physics, and economics. U.S. News and World Report's guide, "America's Best Colleges," the most widely read college guide in the country, ranks UCSB the 16th best public university in the nation. UCSB was selected as one of the first California Institutes for Science and Innovation. Among all applicants (47,893 for Fall 2006), 12,033 had a high school Grade Point Average of 4.0 or higher. UCSB has three undergraduate colleges: the College of Letters & Science, the College of Engineering, and the College of Creative Studies. The College of Creative Studies offers students an alternative approach to education by allowing them to pursue advanced, independent work in the arts, mathematics, and sciences. The campus also has two professional schools, the Donald Bren School of Environmental Science, located in Bren Hall, and the Gevirtz Graduate School of Education. UCSB also hosts eight National Research Centers, including the Kavli Institute for Theoretical Physics (at which many of the world's prominent theoretical physicists, including Stephen Hawking, are regular visitors) and the Materials Research Laboratory. Five of these Centers are supported by the National Science Foundation. Its faculty includes 5 Nobel laureates, 25 members of the National Academy of Sciences, 24 members of the National Academy of Engineering,and 21 members of the Academy of Arts and Sciences. In addition to five winners of Nobel Prizes, UCSB's faculty includes many elected members or fellows of the American Academy of Arts and Sciences (25), the National Academy of Sciences (27), the National Academy of Engineering (27), and the American Association for the Advancement of Science (38). UCSB is one of only 62 institutions elected to membership in the prestigious Association of American Universities. And the Newsweek guide to America's best colleges has named UCSB one of the country's "hottest colleges" twice in the past five years.